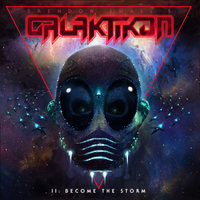 Known mostly for the virtual band DETHKLOK from the satirical animated series METALOCALYPSE, Brendon Small and company return for their latest triumph Brendon Small’s Galaktikon II: Become the Storm. Although Small lost the rights to the name DETHKLOK, make no mistake. This is DETHKLOK. Featuring Bryan Beller on bass and Gene Hoglan on drums, all original members are back to bring us another truly amazing album. Starting off the album, “Some Days Are For Dying” fades in with a guitar harmony consistent with that full bodied tone that DETHKLOK is so well known for. Everything in this song is so familiar but also feels a lot smoother and less gritty than previous works. “Icarus Six Sixty Six” is a fast paced melodic crowd pleaser that continues to reacquaint us with the band but also features more vocal highs giving the impression that Small is distancing himself from his old “Nathan Explosion” vocal style. This impression is confirmed in the next song “The Agenda” where Small sings in a few different styles ranging from clean baritone lows to nasally highs and even falsettos. This new sound manifests itself as the “epic” of the album, “The Ocean Galaktik” which clocks in at just under 8 minutes. The pace is a little slower on this one which gives off more of a build up towards the middle and end of the song that ultimately culminates as the perfect fusion of the old DETHKLOK sound and the newer GALAKTIKON vibe. The name is especially appropriate on this track as it definitely makes you feel like you are soaring through a sea of stars towards the ending. “My Name Is Murder” brings us back to that older sound but with thrashy rhythm and Small seemingly channeling his “Nathan Explosion” persona again. It feels like this song was placed here only to separate the epic “The Ocean Galaktik” from the title track “Become the Storm.” Once again switching up vocal styles, Smalls voice is altered during certain sections on this track to give off a somewhat robotic impression while still howling over top with his crushingly low growls. Drums perfectly synchronize with the rhythm guitar while keys fill the background giving off a feeling that can only be described as cosmic. Still riding on this cosmic sound, “Nightmare” descends upon us with a vastly different approach yet still feeling incredibly familiar at parts. Small uses mostly clean vocals but Beller and Hoglan really shine on this one, shredding on the bass and slamming the drums with slow paced blast beats respectively. Going for a more traditional approach on the next one, “Could This Be The End” stands out with a notable bass presence and plenty of triplets on the guitar. With memorable melodies, incredibly rhythmic growls and sing along group vocals, this song feels like a DETHKLOK tribute to IRON MAIDEN. “To Kill a God” is much more keyboard oriented than other tracks. A lot of different effects are used on this one with a certain part even sounding like a video game before Small gets some really intense shredding in. In the end this one feels a little bit more like a transitionary track as the intro takes up an entire minute of this 4 minute song. Adding to this transitionary feeling is the military style drumming that is not only secluded to the intro but used in other parts of the song as well. On a complete opposite end of the spectrum, the intro to “Exitus” is short and sweet leading into a song that is both slower and cleaner than most on the album, yet still heavy enough bang your head to. Bringing the album to a close, “Rebuilding a Planet” feels like the perfect choice. You can almost see the credits roll on this beautifully melodic closer. With a perfectly paced intro that could have gone a thousand different directions, the band leads into an instrumental body allowing each member to show off their prowess without actually showing off. The song gains momentum until the very end when a sound that could be interpreted as a portal closes on this incredible album. As a whole, Brendon Small’s Galiktikon II: Become the Storm is an exceptionally brilliant album. It’s rare to see a band that can be so melodic and at the same time never compromise the more brutal aspects of death metal, yet GALAKTIKON does this in spades. In a way, this album feels like it could be considered DETHKLOK with a space vibe, but it is clear the band is evolving and is so much more than that. Fans of METALOCALYPSE rejoice, DETHKLOK lives on.